Wonder Invisible is a very popular thin, clear monofilament. Use it for stitch-in-the-ditch, hand or machine applique, quilting when you don't want the thread to show, apparel hemming. Use the Smoke shade for darker fabrics. 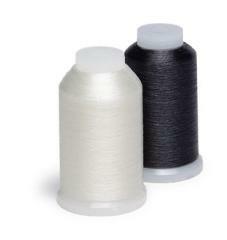 Contrary to widespread misinformation, Wonder nylon monofilament will not melt with a home iron - but we also offer a Poly version for those who refuse to believe.